now $65, originally $145. 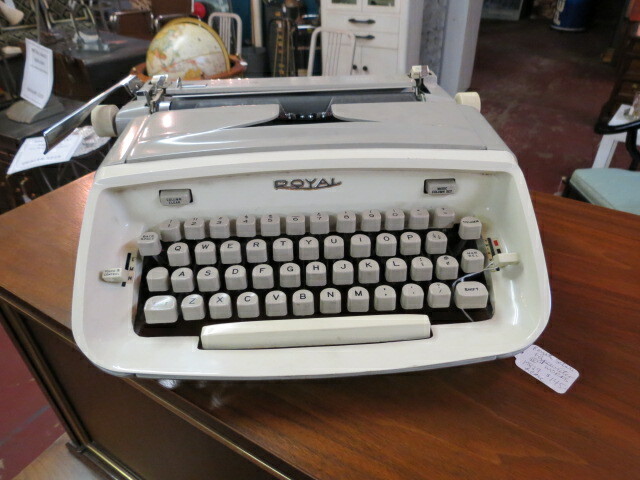 Vintage Royal Safari typewriter. Works. Excellent condition. Delivery available. Call Lincoln Antique Mall located at 3115 W Irving Park Rd. for more info 773-848-3070. We're open Monday- Saturday 11-7, Sunday 12-6. 7500 square feet of vintage and antiques! Voted best antique store in Chicago. Like us on Facebook to see the newest arrivals. WE BUY vintage and antique furniture, chandeliers. now $65, originally $145. Vintage Royal Safari typewriter. Works. Excellent condition. Delivery available. Call Lincoln Antique Mall located at 3115 W Irving Park Rd. for more info 773-848-3070. We’re open Monday- Saturday 11-7, Sunday 12-6. 7500 square feet of vintage and antiques! Voted best antique store in Chicago. Like us on Facebook to see the newest arrivals. WE BUY vintage and antique furniture, chandeliers.